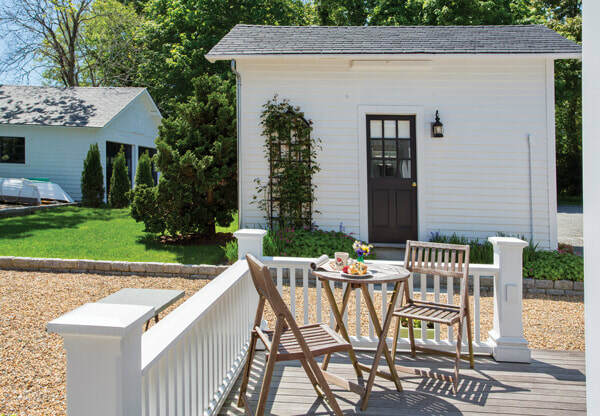 This 1873 Victorian gem of Vineyard Haven’s William Street Historic District is one of the youngest homes on the street. The district includes more than 50 contiguous buildings, predominantly residential, located above the harbor. Three planned developments were constructed from 1833 to 1858, primarily in the Greek Revival style. The original owner of this home, Capt. 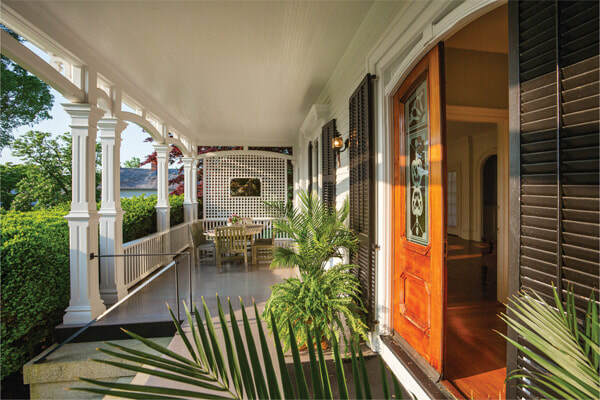 Benjamin C. Cromwell, chose the Italianate style popular in his time, known for its ornate brackets, wide overhanging eaves and cupolas meant to emulate farmhouses of the Italian countryside. This pristine six-bedroom, five-bath home and one-bedroom, one-bath studio-style guest house are located on a quiet, tree-lined street just steps from all the activities of downtown and the harbor. 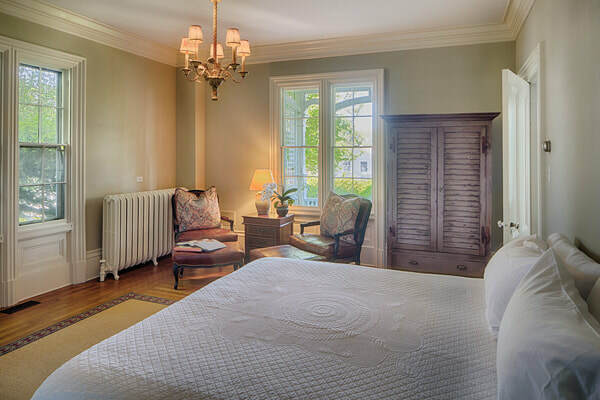 The current owners completed a meticulous and carefully thought out renovation with a great respect for the past. 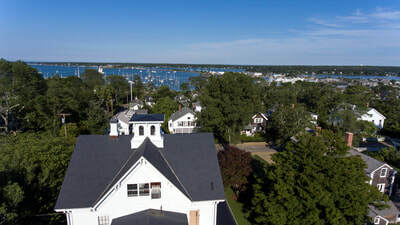 Set back from the street by an ornate cast iron fence, the house is located at the highest point on the lot to capture the water view. 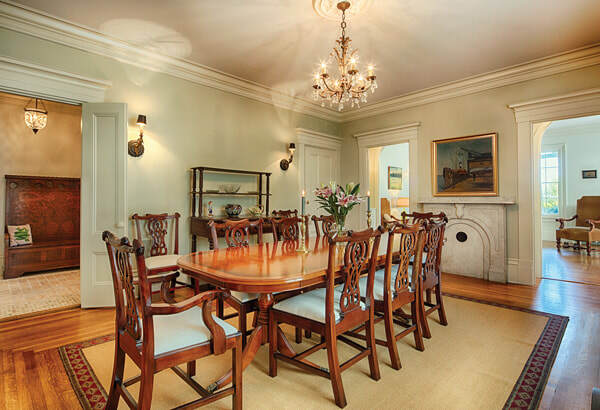 Original ornate crown moulding, marble fireplace mantels, tall ceilings, horsehair plaster walls and hardwood floors appear throughout the home. The front veranda that stretches the length of the building and continues down the left-hand side provides winter views of the harbor and has hosted more than one wedding. The formal entrance through frosted glass, arched double doors opens to a spacious foyer. To the left is the living room with French doors leading to the front and side veranda. In warm weather parties can spill gracefully outdoors. Arched doorways on either side of the room reveal the formal dining room with its original paneling and ceiling medallion. There is a full bathroom off the dining room. To the right of the front door is a luxurious master suite with a sitting room/library, elegant bathroom with a shower and soaking tub and access to the outdoor shower. Through another set of frosted double doors, the foyer enters into a chef’s kitchen that balances sophistication with performance. 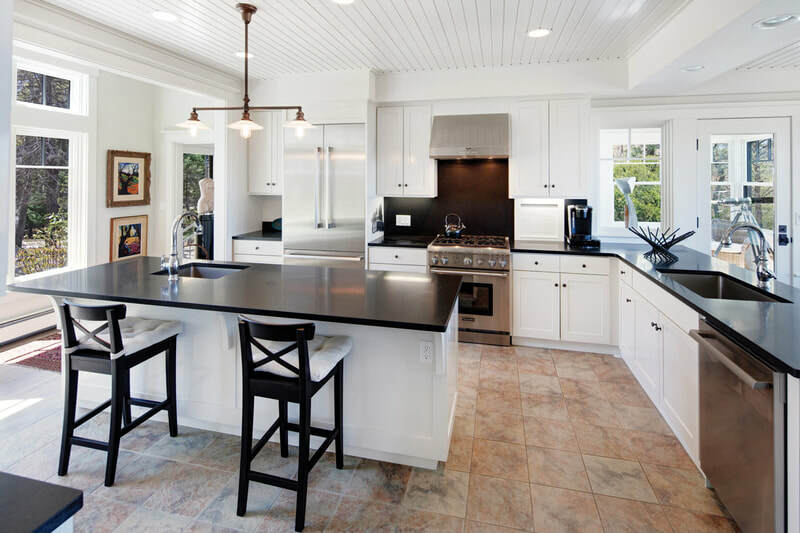 High-end appliances, a breakfast bar, a wood burning fireplace in a small sitting area and ample countertops and storage blend style and function. “The long leaf yellow pine island countertop is fashioned from leftover material used in the restoration of the Black Dog’s ship Alabama,” the owner said. This wood was also used for the countertop in the master bath. French doors from the kitchen open to a deck and the side garden. Behind the kitchen is a pantry and laundry room with closets and shelving. 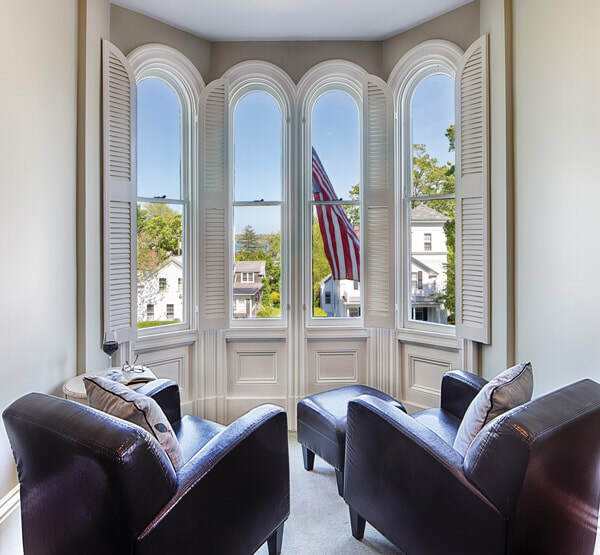 The winding front stairway leads to a second floor hallway flooded with light from the bay window that offers views of downtown and the harbor. Here another master suite has a bedroom, full bath and a sitting room that could be an additional bedroom. Two more bedrooms share a full bath and small study. To the rear is another bedroom, sitting room, wet bar and full bath that can be a private suite. 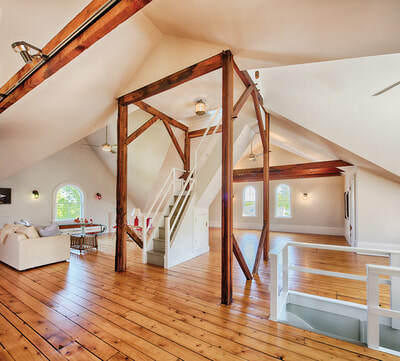 The light and airy third floor loft reveals the original post and beam construction and provides a wonderful entertainment area, artist’s retreat or playroom. “There have been many parties up here,” the owner says. Stairs lead to the cupola that offers stunning views over town and as far as Falmouth. It’s a private and serene setting on one of the larger lots in the downtown area with a rolling lawn with manicured shrubs and perennial gardens. 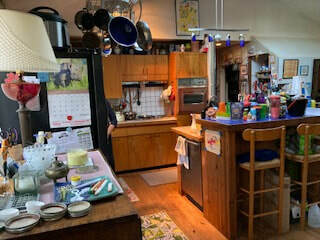 In the rear is a guest house with cathedral ceiling, one bedroom with kitchenette, full bath, and loft, the original outhouse, a two-car garage converted from the original barn and ample parking complete the property. Edgartown resident and New Yorker artist Jenni Oliver painted the home in soft summer colors for the cover of the September 3, 1983 issue. A Vineyard Haven resident for five years, Ms. Oliver told the Vineyard Gazette she used to walk past the house and wonder what went on inside. “I remember all the years I walked by, wanting to sit on that porch,” she said. While walking her dog late one night she got up her nerve and did just that “for a minute.” It’s still a magical place to sit.